Also published in German, Danish, Turkish, French, Polish, Spanish (Latin America) and Dutch. Download The Chocolate Factory Ghost activity pack here. 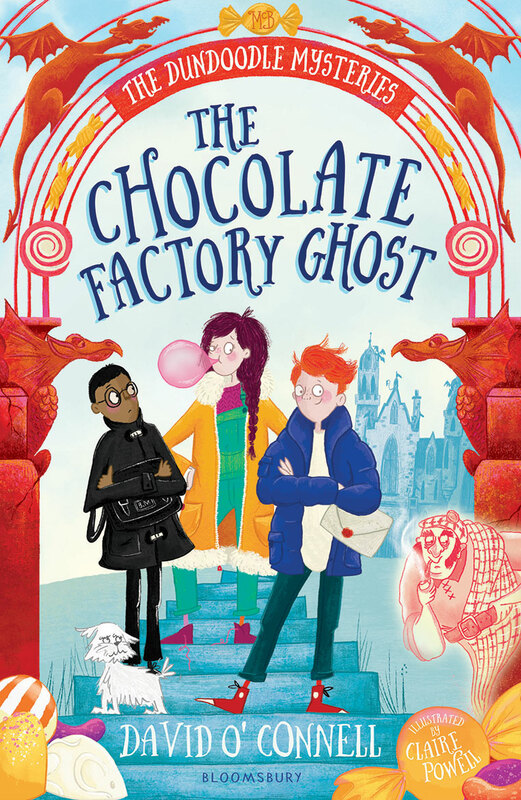 The Chocolate Factory Ghost on GoodReads. Archie McBudge knows his lucky underpants must really work, because when he and his mum are summoned to Honeystone Hall in the remote Scottish village of Dundoodle, they find Archie has inherited not only the enormous hall, but the whole of the world-famous McBudge Confectionery Company from Great-Uncle Archibald. That’s a new home, a fortune and a lifetime’s supply of treats rolled into one! But all is not well in Dundoodle, and when Archie reads the mysterious letter his great-uncle left him he finds himself on a quest to save his family’s company from ruin. With the help of his new friends Fliss and Billy, Archie has to try and figure out the puzzles of Honeystone before his sweet future melts away like an ice lolly in the sun! Addictive as a chocolate orange. I read it pretty much in one go… definitely worth getting your hands on, and a lovely one to share with children. This is the best treasure hunt ever!! If you like mysteries and adventure, you won’t be able to put this book down – I couldn’t!…This book is amazing!!! The puzzles were so clever, so much so I can only wish I had been able to solve a few, not to mention that I liked them all the more for being themed around sweets. I am happy to say this is a great read! And could you send me book 2 please? …This is simply a treat for young readers: inventive and funny, mysteries and puzzles galore and fabulous illustrations from Powell. It’s a full-on fantasy escapade that will have you fizzing with delight. The more you read, the more you will be hit by the feel-good factor. You know you’re onto a winner when the children around you are snickering by the second paragraph, laughing by the next page, and begging to read the following chapter when the bell goes. Imagination, a good story, and wonderful inventive descriptive English – what more could you want? I found the story to be a humorous romp, with likeable characters and just the right amount of silliness for younger readers. A brilliant read aloud that will enthuse and enrapture the most reluctant reader. …this is a thoroughly satisfying and entertaining story, a delicious mix of adventure, comedy and magic. The Chocolate Factory Ghost is such a good-hearted story… But it’s also deceptively clever. The Chocolate Factory Ghost sets the scene well for what will hopefully be a long running series of Dundoodle Mysteries, as my boys are hooked. Full of adventure, heart and humour I defy anyone to read this and not laugh out loud, whilst craving the wonderful fudge creations described. A thoroughly entertaining tale, this book has just about everything and child would want. … a deliciously compelling read.